Before We start the review, I want to mention a very important fact. Lifegear went out of business in 2007. That’s means it will be extremely hard to get replacement parts or warranty. Which are the best inversion tables available today. Before they went out of business in 2007, Lifegear manufactured nine models of inversion tables. 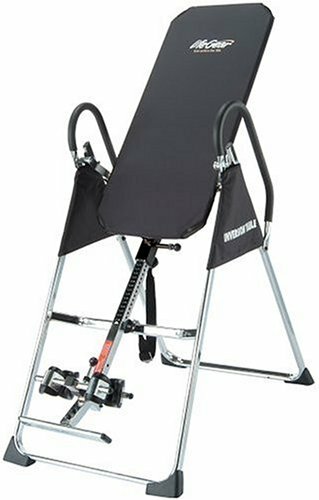 The Life gear inversion table model no. 75112 was once the now defunct company’s bestselling model. Lifegear’s Deluxe Inversion Table features durable steel construction and a scratch-resistant powder coated frame. This makes it durable in spite of the fact that it is capable of supporting users weighing up to 300 pounds and 6 feet, 6 inches tall. The back rest is equally, tough, having been constructed of tough vinyl material that also provides for extra inverting. The manufacturer equipped this model with unique, non-skid stabilizers for extra stability when the tale is in use. While the life gear inversion table doesn’t come with all the bells and whistles associated with high end models, it will turn you upside down and back to an upright position in one piece. The table features an angle-adjusting tether. This combines with the maneuverability handles to provide users with safe and care free daily usage. The tubular steel frame offers firm support and can support anyone who does not exceed 300 pounds. This means that it can be used by most regular sized people. The table comes with an instructional video that demonstrates how to set it up the table for first use, how to tweak the safety straps to control the maximum angle of inversion and how to secure the ergonomically-molded ankle straps comfortably and securely. It has a nylon safety tethers to provide for multiple inverting angles without injuring the feet and the backrest is constructed with tough vinyl that provides for additional comfort when inverting. To maximize body stability while inverting , it is equipped with safety handles that make the process of returning the body to the upright position smooth, as well as molded ankle cushions that are ergonomically designed to fully fit an relax the user’s ankles when in use. The inversion table was designed to do more than just relieve the stress on the back; it is the ultimate full body soother. It stimulates blood circulation as you work on your discs to relieve stiffness in your muscles and stress on your back. It also increases body flexibility and therefore your athletic performance, for this reason, many doctors recommend this model as a way of working out back problems. Safety is another great advantage in this inversion table. It features safety handles which can be used during inversion to bring yourself back to an upright position. So, you can use the LifeGear 75112 to your heart’s content, and not have to worry about someone being around to help you get back up. A safety tether is also available with this model, meaning you can invert to different angles if needed, rather than just simply upside down and upright. This is great for someone who is just starting out in inversion therapy and wants to slowly ease themselves into it. The material used for the table is supportive and strong so that you don’t feel as though you’re slipping or moving around. As your ankles will be taking most of the pressure, it’s important to know that the ankle straps are ergonomically molded. Ensuring comfort and full support throughout your inversion session. If you suffer from back stress, then this is the table for you. It is ergonomically designed to relieve vertebrae pressure as well. Overall, the LifeGear 75112 is a strong contender in our list of best inversion tables. It offers stability, comfort and peace of mind for a fraction of the price of other inversion tables. Its tough material and sturdy base means that this investment into your health and well-being will last through the years, and give your body the much needed relief it has been waiting for.